As regular readers here at ProjectGuitar.com you will have followed the first two parts of this series of write-ups regarding the machining of fret slots on a compact CNC machine; the kind of machine typically available for less than $1000 on various online vendors. Part 1 dealt with the construction of a special jig that allows the accurate positioning of the fret board blank such that precise alignment between the two milled halves can be achieved. 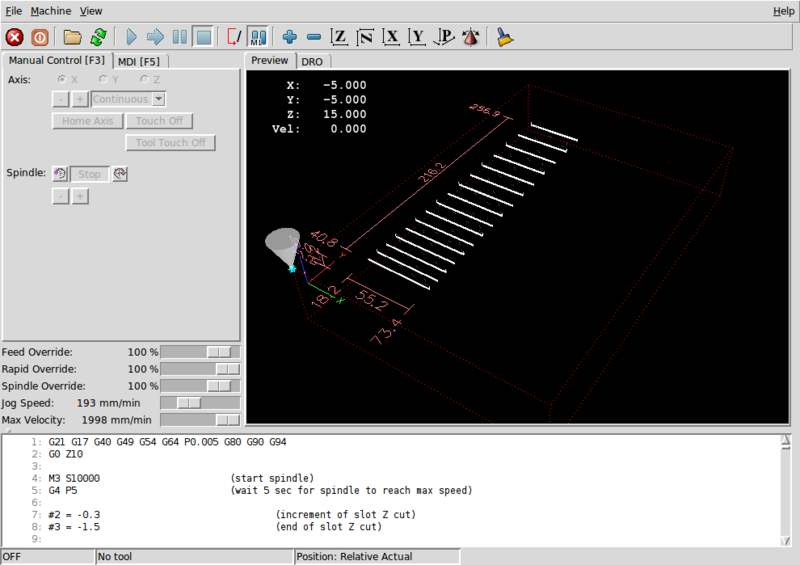 Part 2 covered the necessary formatting of the CAD design of a fretboard created with the FretFind2D web application, such that the milling process was safely executed without damage to the fragile endmills. In this, the third and final article we will finally use the jigs and CAD/CAM files and complete the milling of a fretboard on the CNC machine. Throughout this article I will be using a 0.6mm (or 0.023") diameter endmill to cut the fret slots. The width of this cutter determines the width of the slot being cut and should match the width of the tang of the fretwire being used. In practice a 0.6mm endmill will cut a slightly wider slot by perhaps a few hundredths of a millimetre, due to eccentricity and runout in the spindle. This is advantageous to us; if the 0.6mm cutter could possibly cut a slot exactly the same width as the fret wire tang it would be very difficult to seat the frets. A little bit of leeway will actually help the frets go in easily. The process of slotting the fretboard on the CNC machine is quite slow and wear on the tiny endmills is relatively high. Effectively we are only using the CNC machine to accurately start the fret slot, While it is possible to machine the whole board to the correct depth, it is recommended that cutting the final depth of the fret slot be performed using a hand fret saw with a depth stop. The final accuracy of the slotted board should not suffer from finalising the slots with a handsaw. The low-cost CNC machines may have poor eccentricity specs for the spindle. If this becomes too severe and the fret slot being milled widens too much at the full depth the risk increases of the fret wire not being securely held in place. As ironic as it may sound, it is better that we rely on the CNC as little as possible to maximise our success in this area . Finally, it is highly recommended that you purchase decent quality cutters for this work. Cheap cutters increase the risk of breaking partway through the milling process. They will also likely dull more quickly, and leave behind slots that gradually deteriorate in quality as the work progresses. The endmills I am using are 2-flute cutters made by Kyocera, and are available in bulk packs of 5 or more from several online outlets. Higher-quality endmills with three flutes are also available for a corresponding increase in price - $25 or more for each piece. Right. Enough talking. Lets get machining. Assuming you have a suitable fret board blank at your disposal, use some double-sided tape to secure it to the MDF jig. Position it such that it is centred on the plate as closely as possible. Good planning will dictate that your blank will be cut oversize to allow the excess to be cut off afterwards (it is cut oversize, right?). In this example I am using a piece of Tasmanian Oak. Fit the base plate to the CNC table and tighten it securely. Install the jig with the attached fretboard such that the two holes nearest where the highest fret will be cut are located on the forward holes on the plate. Install some 1/8" pins or spare 1/8" shank cutters in all four corners so that the jig is held securely on the baseplate. Remove the lower-left pin and set it aside for a moment. Turn on the CNC machine and start up the motion control software. Fit a 0.6mm diameter endmill to the collet and home the axes to the extreme minimum limits of their motion, ie X and Y at lowest-left corner of the table and Z at maximum height. Jog the cutter head to just above the centre of the lower-left hole. The and X and Y co-ordinates at this location will form the reference point for the whole milling operation. With the cutter head positioned here touch off the X and Y axes only - do not touch of Z axis yet. Re-install the lower-left pin in the jig and load up the first half of the G-code for the fret board job. As we have the fret board blank positioned at the lower end of the table we will be cutting frets 24 to 9 first. If you analyse the toolpath for each of the fret slots on the screen you will notice that each slotting operation is represented as a series of shallow zig-zag patterns gradually increasing in depth until the final depth of cut is achieved. These are the G-code slotting subroutines we created in Part 2. 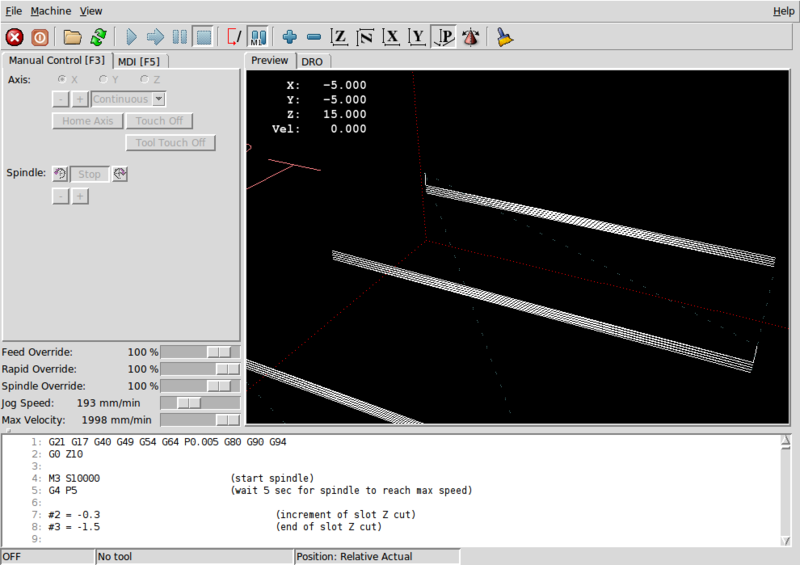 If all appears OK on the motion control software, start the spindle and begin the cutting program. Watch the axis motion and spindle behaviour carefully to see if anything untoward is happening such as excessive vibration or slipping of the fret board on the jig, and be ready to hit the emergency stop button on the mill. Assuming the feed rate is set to around 300mm per minute the first 16 fret slots will take around half an hour to complete. It is a good idea to keep a vacuum cleaner handy while the cutting progresses, as a fair amount of dust and miniature chips will be generated during cutting. Keeping the fret slots clear of chips will also help with minimising wear on the endmill. When the final slot has completed you should have something similar to below. Switch off the spindle, but do not close the motion control software or turn off the power to the CNC machine. We need the machine and software to retain its home and touch-off co-ordinates. Remove all four pins from the jig and slide the plate down such that the first 16 fret slots are overhanging the front of the table. Re-insert the pins in the four holes to re-secure the jig to the bedplate. 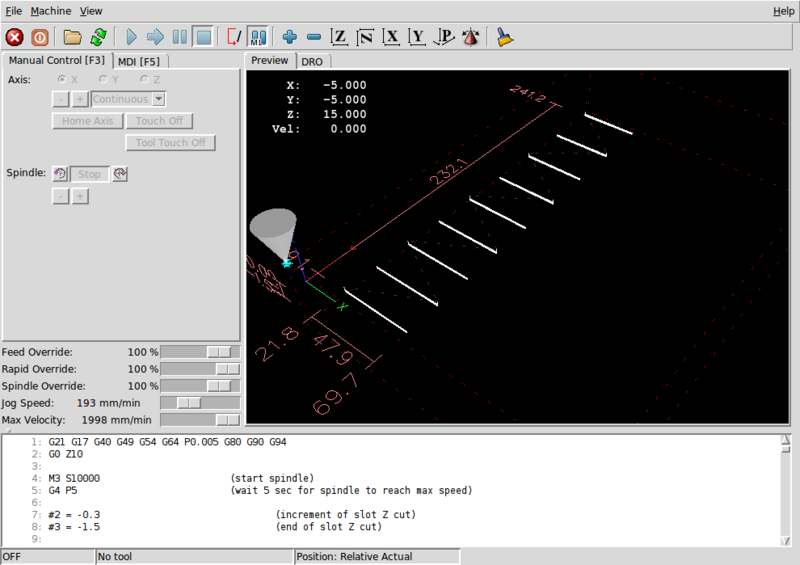 In the motion control software load up the second half of the fret slotting job. This file should contain the slots for frets 8 to 1, plus the nut position. With this file loaded, turn the spindle on and run the code. The cutter head should advance to the beginning of the 8th fret slot and begin cutting. Again, keep a close eye on proceedings and be ready to hit the E-stop button if things appear to be going amiss. As the number of frets being cut has reduced by half the job should take around a quarter of an hour to complete. All that remains now is to gently prise off the board from the jig with a paint scraper or similar, and cut the sides to match the taper of the neck you are building. Using a larger cutter (say 1/8" diameter) the perimeter of the fret board could be machined to give you the correct taper, and also cut off the extremities behind the nut and beyond the 24th fret. If the truss rod you are installing in the neck is the spoke wheel type (with the adjuster at the heel) the notch at the end of the fret board that is normally cut to provide access to the adjuster head can be easily included in the fret board outline. A nut ledge or nut slot could be cut in place of the zero fret slot that we cut in the above example. If your build included a zero fret and nut this could also be incorporated. Multi-scale fret boards can also be machined using the same technique as outlined in these articles. The fret slots are still defined as straight lines, and the slotting subroutines described in Part 2 will work without any modification. Pockets for fret board inlays can be milled in the same fashion. With a little manipulation in CAD/CAM it is also possible to machine precisely sized inlays from contrasting timber, plastics or non-ferrous metals to match these pockets. The fret board radius can be roughed in on the CNC machine, either by progressively running the cutter head in an arc around the Y-axis up the length of the fret board, or by running the cutter head in straight lines parallel to the centre of the fret board in a "staircase" pattern that approximates the radius. Milling Fret Slots on an Undersized CNC Machine - Part 3 by curtisa is licensed under a Creative Commons Attribution-NonCommercial-ShareAlike 4.0 International License.